Summer has officially begun in Boston. Heat waves and sunny days have finally decided to give the Beantown population a chance to enjoy the outdoors and take in the fresh air. All the same, my apartment turns into an oven of its own any time I decided to turn on the stove for more than one minute. Today was not an ordinary day. For starters, I was woken up by my alarm and for once I actually had a very hard time opening my eyes. Consequently, I had to rush through getting dressed and eating breakfast in order to make my passport appointment. Side note, I arrived 15 minutes early (as was told by the appointment person on the phone) only to be turned away by a grumpy receptionist telling me that they would not let anyone in before 9 a.m. I did not appreciate his blunt manner at all. Nevertheless, by 10 a.m. I was grocery shopping, wondering what goodies I could buy while still being able to carry all the bags home. Unfortunately, the "eyes are bigger than your stomach" idiom applied here perfectly. I found myself struggling with 6 heavy bags walking block after block in hot hot weather. Ok, enough with the day description. 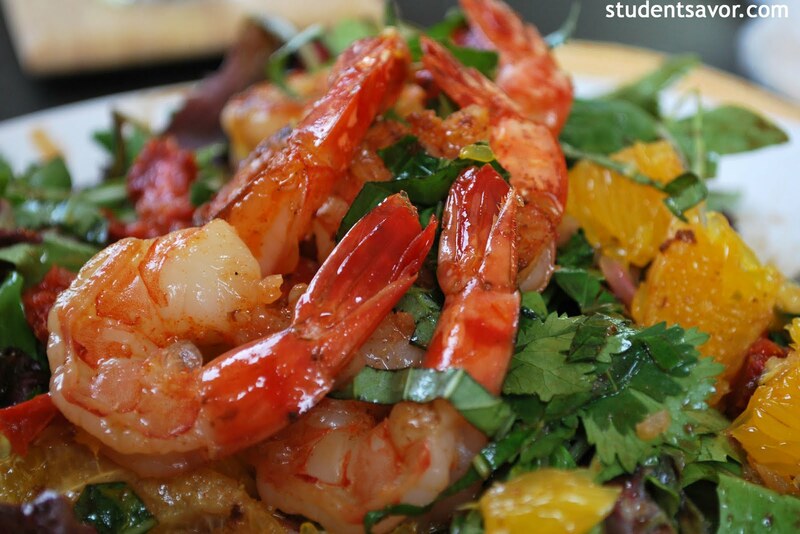 Needless to say, my day was not ordinary, but once I got home I decided to make myself a delicious salad topped with sauteed shrimp. 6 jumbo frozen shrimp, peeled, deveined, and thawed. Heat oil in skillet over medium high heat. In a separate bowl, toss shrimp with paprika and pinch of S & P. Once oil is hot, add shrimp and cook for about 2 minutes or nicely browned, flipping once. 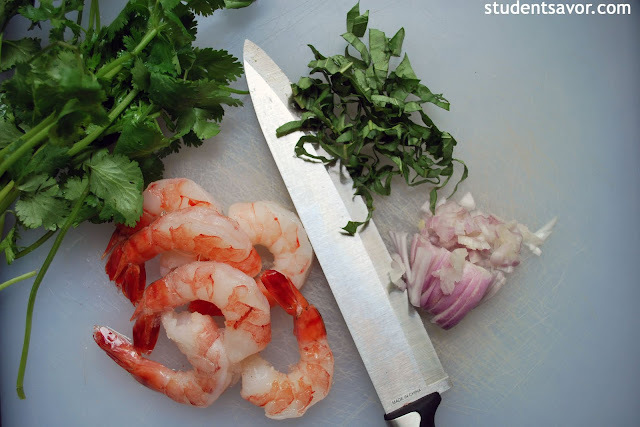 Remove shrimp from skillet and set aside. Add wine, shallots, and sun-dried tomatoes to skillet and boil until liquid is reduced to about half, about 5 minutes. Add broth and reduce to about half, again about 5 minutes. 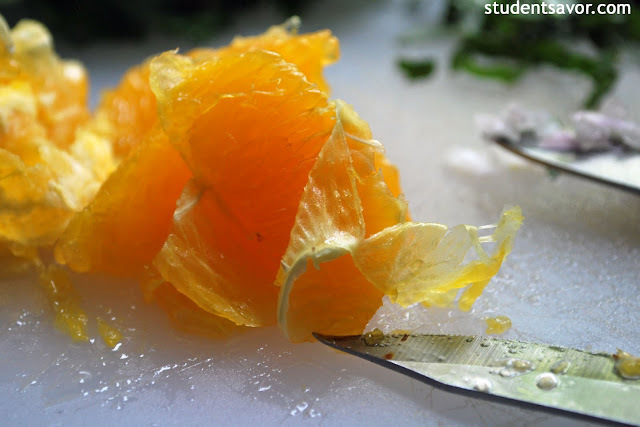 Meanwhile, carefully remove each orange segment from its membrane using a pairing knife. 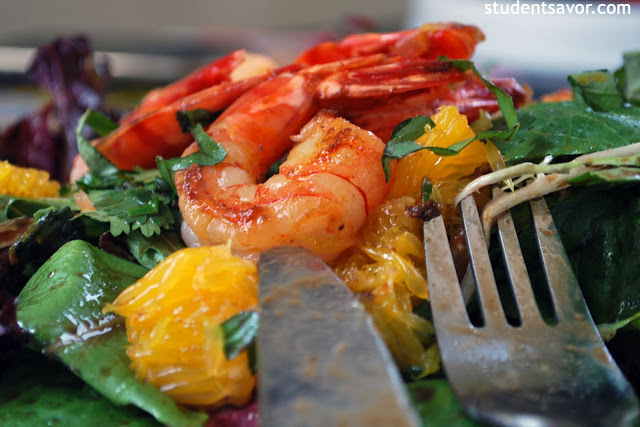 Turn heat to low and add orange to skillet. Stir in butter and half of the basil. 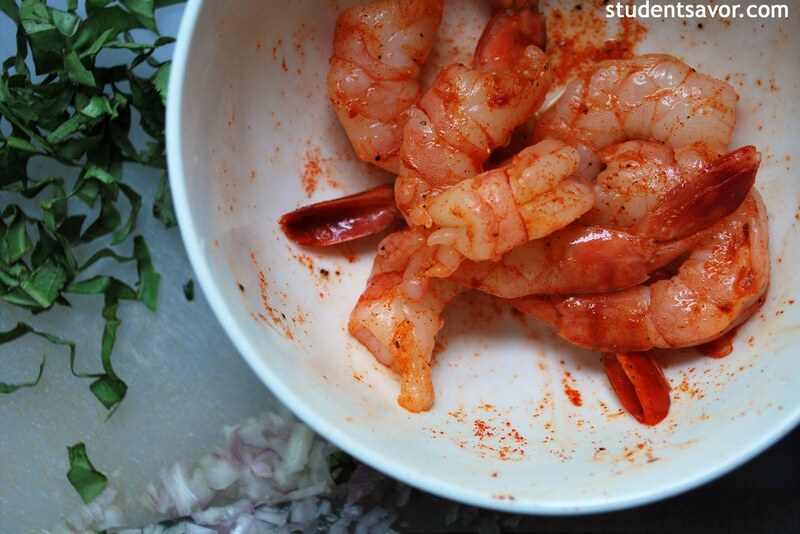 Once butter is melted, add shrimp and toss in sauce. 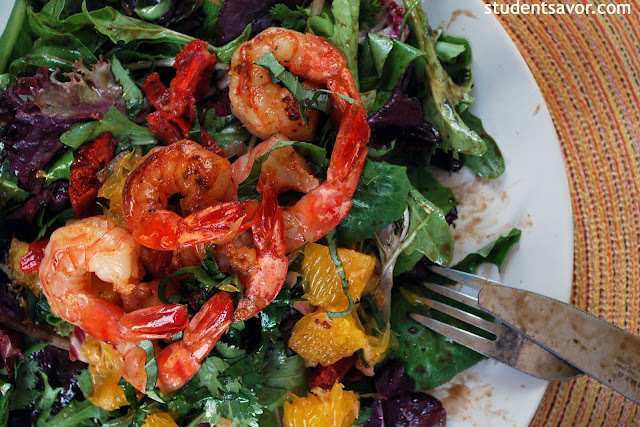 Serve shrimp atop salad, rice, or pasta.